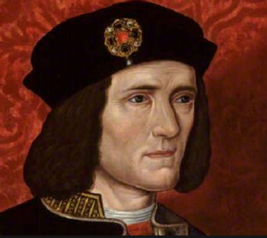 Richard III, the eleventh child of Richard, Duke of York, and Cecily Neville, was born October 2, 1452. He was created third Duke of Gloucester at the coronation of his brother, Edward IV. Richard had three children: one each of an illegitimate son and daughter, and one son by his first wife, Anne Neville, widow of Henry IV's son Edward. Richard III is my 19th cousin, 14 times removed. Richard III is the 1st cousin seven times removed of Edward Carlton, the husband of Ellen Newton, the stepdaughter of Danette Abney, my 6th great grand uncle. The year following his birth, German inventor, Johann Gutenberg, developed the printing press and printed the first Bible in 1453. Richard's reign gained an importance out of proportion to its length. He was crowned King on July 6, 1483. He was the last of the Plantagenet dynasty, which had ruled England since 1154; he was the last English king to die on the battlefield; his death in 1485 is generally accepted between the medieval and modern ages in England; and he is credited with the responsibility for several murders: Henry VI , Henry's son Edward, his brother Clarence, and his nephews Edward and Richard. Richard's power was immense, and upon the death of Edward IV , he positioned himself to seize the throne from the young Edward V. He feared a continuance of internal feuding should Edward V, under the influence of his mother's Woodville relatives, remain on the throne (most of this feared conflict would have undoubtedly come from Richard). The old nobility, also fearful of a strengthened Woodville clan, assembled and declared the succession of Edward V as illegal, due to weak evidence suggesting that Edward IV's marriage to Elizabeth Woodville was bigamous, thereby rendering his sons illegitimate and ineligible as heirs to the crown. Edward V and his younger brother, Richard of York, were imprisoned in the Tower of London, never again to emerge alive. Richard of Gloucester was crowned Richard III on July 6, 1483. Four months into his reign he crushed a rebellion led by his former assistant Henry Stafford, Duke of Buckingham, who sought the installation of Henry Tudor, a diluted Lancaster, to the throne. The rebellion was crushed, but Tudor gathered troops and attacked Richard's forces on August 22, 1485, at the battle of Bosworth Field. The last major battle of the Wars of the Roses, Bosworth Field became the death place of Richard III. Historians have been noticeably unkind to Richard, based on purely circumstantial evidence; Shakespeare portrays him as a complete monster in his play, Richard III. One thing is for certain, however: Richard's defeat and the cessation of the Wars of the Roses allowed the stability England required to heal, consolidate, and push into the modern era. LEICESTER, England � He wore the English crown, but he ended up defeated, humiliated and reviled. Now things are looking up for King Richard III. Scientists announced Monday that they had found the monarch's 528-year-old remains under a parking lot in the city of Leicester � a discovery that will move him from a pauper's grave to a royal tomb and that fans say could potentially restore the reputation of a much-maligned king. "We could end up rewriting a little bit of history in a big way," said Lin Foxhall, head of the school of archaeology at the University of Leicester, which conducted the research. On Monday the researchers announced that tests on a battle-scarred skeleton unearthed in the central England city last year prove "beyond reasonable doubt" that it is the king, who died at the Battle of Bosworth Field in 1485, and whose remains have been missing for centuries. "Richard III, the last Plantagenet King of England, has been found," said the university's deputy registrar, Richard Taylor, describing the find as "truly astonishing." Few monarchs have seen their reputations decline as much after death as Richard III. He ruled England between 1483 and 1485, during the decades-long tussle over the throne known as the Wars of the Roses, which pitted two wings of the ruling Plantagenet dynasty � York and Lancaster � against one another. But his rule was challenged, and he was defeated and killed by the army of Henry Tudor, who took the throne as King Henry VII and ended the Plantagenet line. Death was just the start of Richard's problems. Historians writing under the victorious Tudors comprehensively trashed his reputation, accusing him of myriad crimes � most famously, the murder of the "Princes in the Tower," the two sons of his elder brother, King Edward IV. William Shakespeare indelibly depicted Richard as a hunchbacked usurper who left a trail of bodies on his way to the throne before dying in battle, shouting "My kingdom for a horse." That view was repeated by many historians, and Richard remains a villain in the popular imagination. But others argue that the image is unfair, and say Richard's reputation was smeared by his Tudor successors. Philippa Langley of the Richard III Society � which seeks to restore the late king's reputation � said for centuries Richard's story had been told by others, many of them hostile. She hopes a new surge of interest, and new evidence from the skeleton about how the king lived and died � and how he was mistreated after death � will help restore his reputation. "A wind of change is blowing, one that will seek out the truth about the real Richard III," she said. The location of Richard's body was unknown for centuries. Records say he was buried by the Franciscan monks of Grey Friars at their church in Leicester, 100 miles (160 kilometers) north of London. The church was closed and dismantled after King Henry VIII dissolved the monasteries in 1538, and its location eventually was forgotten by most local residents. But last year a team led by University of Leicester archaeologist Richard Buckley identified a possible location of the grave through map regression analysis, starting with a current map and analyzing earlier maps to discover what had changed and not changed. Ground-penetrating radar was employed to find the best places to start digging. The team began excavating in a parking lot last August. Within a week they had located thick walls and the remains of tiled floors. Soon after, they found human remains � the skeleton of an adult male who appeared to have died in battle. He had been buried unceremoniously, without coffin or shroud � plausible for a despised and defeated enemy. Researchers could scarcely believe their luck, and set out to conduct a battery of scientific tests, including radiocarbon dating to determine the skeleton's age, to see whether, against the odds, they really had found the king. Otologist Jo Appleby, a lecturer in human bioarcheology at Leicester, said study of the bones provided "a highly convincing case for identification of Richard III." Appleby said the 10 injuries to the body were inflicted by weapons like swords, daggers and halberds and were consistent with accounts of Richard being struck down in battle � his helmet knocked from his head � before his body was stripped naked and flung over the back of a horse in disgrace. She said some scars, including a knife wound to the buttock, bore the hallmarks of "humiliation injuries" inflicted after death. DNA from the skeleton matched a sample taken from Michael Ibsen, a distant living relative of Richard's sister. The project's lead geneticist, Turi King, said Ibsen, a Canadian carpenter living in London, shares with the skeleton a rare strain of mitochondrial DNA. She said combined with the archaeological evidence, that left little doubt the skeleton belonged to Richard. Ibsen said he was "stunned" to discover he was related to the king � he is a 17th great-grand-nephew of Richard's older sister. "It's difficult to digest," he said. The researchers said their findings had not yet been published in peer-reviewed scientific journals, but soon would be. Archaeologist Mike Pitts, editor of British Archaeology magazine, said he found the evidence persuasive. "I don't think there is any question � it is Richard III," said Pitts, who was not affiliated with the research team. On Monday, the king's skeleton lay in a glass box in a meeting room within the university library. It was a browned, fragile-looking thing, its skull pocked with injuries, missing its feet � which scientists say were disturbed sometime after burial � and with a pronounced s-shape to the spine. "We have searched for him, we have found him � it is now time to honor him," she said. Copyright 2013 World Publishing Co. All rights reserved. This material may not be published, broadcast, rewritten or redistributed.